Sports Costs > How Much Does FieldTurf Cost? How Much Does FieldTurf Cost? FieldTurf, an artificial grass company, is made from washed silica sand and cryogenic fiber. This engineered system is a synthetic turf system that’s able to combine the biomechanical properties of real grass, with the best durability and safety attributes. FieldTurf can commonly be found on football fields, soccer fields and even as a replacement in the backyard of a home. On average, the price of field turf can range anywhere from $4 to as much as $6 per square feet. This won’t include the drainage base, which will often be another $4 per square foot. When the drainage base and FieldTurf is combined, the costs can be in the $6 to $12 per square foot range, excluding the labor costs. According to the official website, they claim the cost will depend on the exact product and will vary from region to region. It will also depend on the type of surface the turf will be used on. As a conservative estimate, the website says you should budget about $4 per square foot for the drainage base for a full-sized soccer and close to $4.75 per square foot for the turf panels. This report offered by Wellesley, Massachusetts, created an analysis for the costs they came across. According to the report, the material would cost $4.50 per square foot and the preparation would be another $160,000 for an 80,000 square foot field. Doing the math, the preparation and FieldTurf.com would be about $6.50 per square foot. Ultimately, the cost per hour would be close to $12.95 when compared to $49.72 for natural grass. Forbes did a study comparing artificial turf to the most expensive grass and had found over the long run, it could be 49 percent more to install turf such as this. The drainage base, which consists of a compacted stone material, will offer a level surface and allows the prescription to trickle through before reaching the drainage system. This drainage base, according to the company, can last up to 30 years. After the drainage base has been installed, the FieldTurf panels, which mimic the look of carpet, will be laid on top of this base and the infill will then be layered into the carpet to provide the footing. 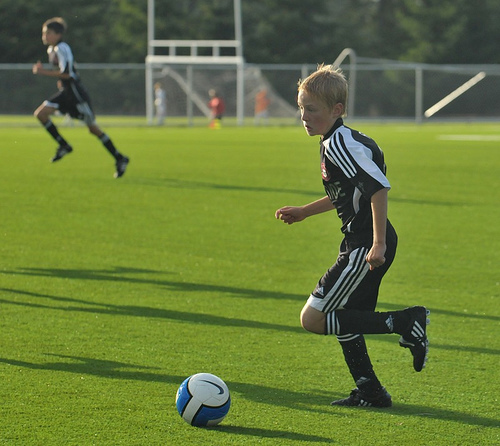 The average soccer and/or football field should budget for 80,000 square feet. The average installation process can take up to 60 days to complete. The company claims the industry standard is eight years when it comes to the longevity; however, they have seen turf last longer than 13 years. $5,000 should be set aside annually for maintenance purposes. The costs, according to some reports, is fairly minimal. This may include removing leaves and debris, often done by a vacuum system. The field should also be brushed every six weeks, depending on the use, to redistributed the infill material that may have migrated. Refer to this maintenance guide to see all of the work that needs to be done annually. The FieldTurf company is known to be the only company that uses a real life, third-party testing for player safety on the fields. Remember, FieldTurf is an artificial grass brand. Be sure to compare other corporations or even weigh the pros and cons of real grass.